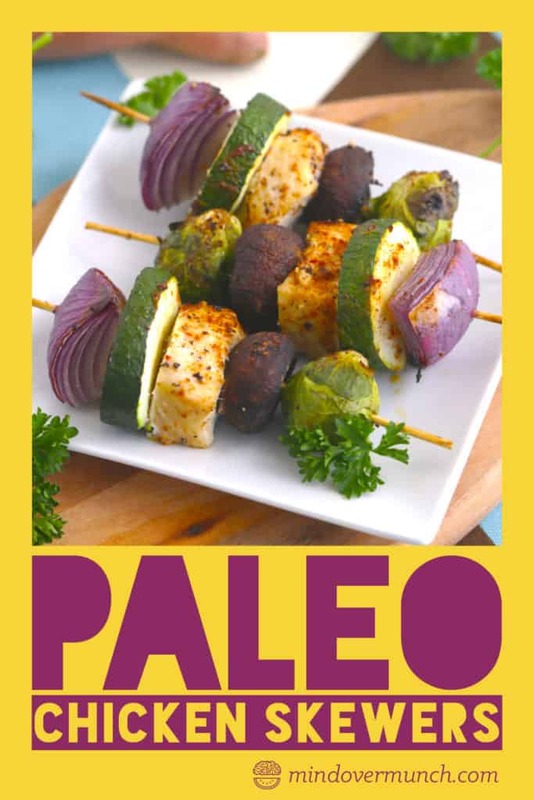 Baked Chicken Skewers with Zucchini, Mushrooms, & Brussels Sprouts – Paleo & Whole30 Dinner! 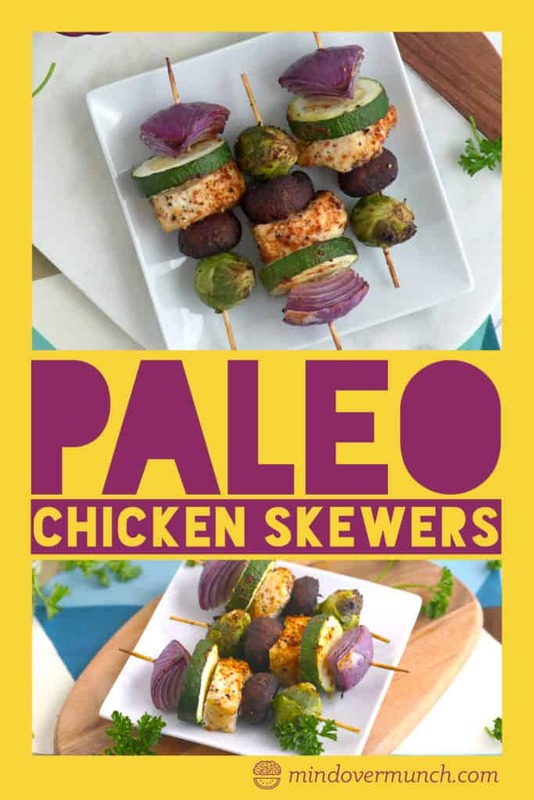 Skewers make any meal more fun, and they make dinnertime so EASY! 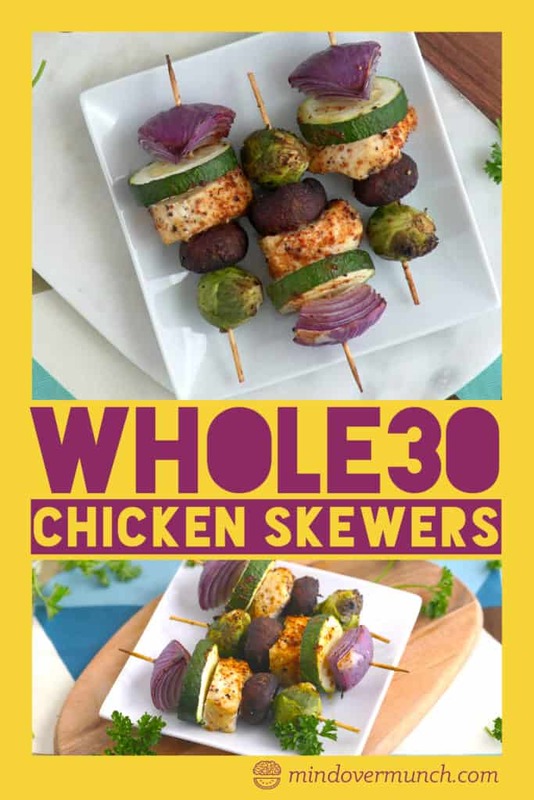 These baked chicken skewers get your protein and vegetables cooked all at once, making them ideal for meal prep an easy weeknight dinner. And, with one ounce of chicken per skewer, they’re perfectly pre-portioned! This was a quick Whole30 dinner recipe I threw together one night, and it turned out to be so simple and delicious. But, feel free to get creative with your favorite veggies and flavorings! And, don’t be afraid to experiment in the kitchen with no recipe at all. Honestly, the best ingredients for tasty recipes are the ingredients that YOU will enjoy! Make these baked chicken skewers your own. Let’s be real, this baked chicken skewers recipe is essentially just roasted chicken with vegetables. It’s not complicated, or even very special… but something about putting food on a stick makes it so much more enticing! And, I’m not saying just for kids… I’m saying anyone! Adults included. It just switches up the routine and makes dinner a little more interesting! So, don’t feel like you have to be stuck to this baked chicken skewers recipe. Use your favorite vegetables, change up the seasonings, marinate the chicken! Or, even use a different cut of chicken for more flavor, like the thighs. Regardless, remember to soak your skewers if you’re using wooden ones. If you have metal ones, don’t worry. (And, good for you for saving the planet!) But, the wooden ones will burn in the oven if they aren’t soaked—20-30 minutes is all they need. I usually just put them in a tray filled with water and weigh them down with some mason jars or glasses so they’re submerged! 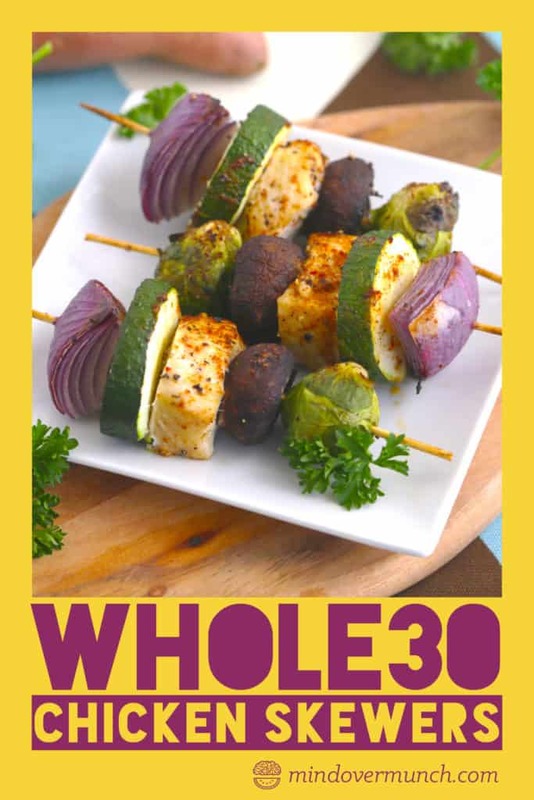 One thing to keep in mind when designing your own quick Whole30 dinner ideas using skewers is that vegetables roast up differently. You’ll often see different temperatures and cooking times for different veggies. But, I’ve found it doesn’t make a huge difference to keep them at the same temperature, as long as they’re cut to a similar size.So, when making this baked chicken skewers recipe or your own, try to get the vegetables to be about the same size so some aren’t cooking faster than others in the oven. And, don’t be afraid to go off-recipe with your own ideas! 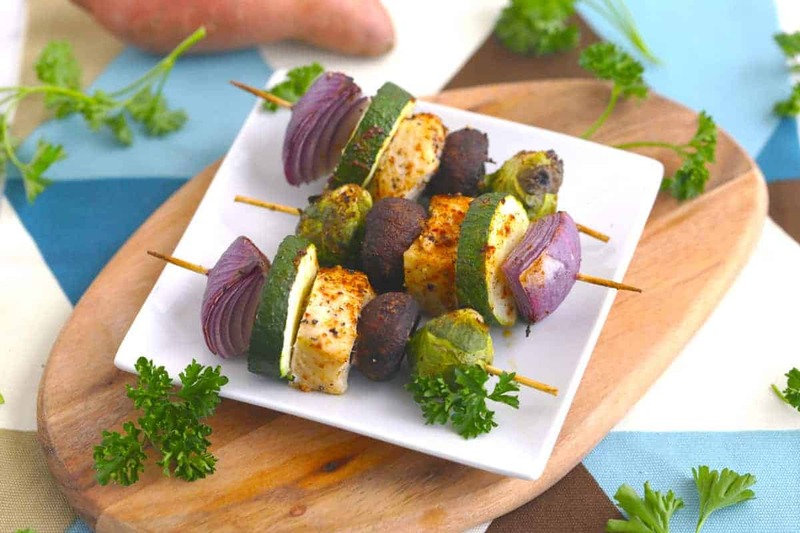 Place skewers in a dish, cover with water, and soak for at least an hour before roasting. Remove from water and rest on paper towels before assembling. Assemble prepped chicken and veggies on skewers. For some tougher veggies (like Brussels sprouts), it can help to use a separate skewer to carve a hole through it before assembling! Place assembled skewers in a large mixing bowl. Drizzle with oil, sprinkle on seasonings, and toss to coat. Place skewers on a wire baking rack on a lines baking sheet. Roast for 25 minutes. Serve and enjoy! Yields 4 baked chicken skewers.